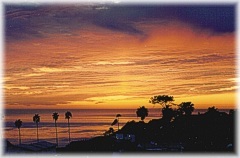 San Diego enjoys more than 150 miles of beautiful coastline on the Pacific Ocean, Mission Bay and San Diego Bay. If you're a surfer, swimmer, boater or just someone who loves to walk on the beach, you'll find the chart for San Diego tides to be helpful. What causes the San Diego tides? San Diego tides are the alternating rise and fall of the sea level, produced by the gravitational forces of the Moon and the Sun. The Sun has a bigger mass than the moon and exerts a stronger gravitational attraction on the earth. However, it's further away than the Moon. Because of this relative closeness of the Moon to the earth, its gravitational pull is more than twice that of the Sun and it has more effect on San Diego tides. What other factors affect the tides in San Diego? Many other elements influence San Diego tides including: coastline shape, water depth, ocean-floor topography, barometric pressure, winds and the San Diego Weather Forecast. These factors alter the times of San Diego tides, their range and the interval between high and low water. The tidal cycle is 24 hours, 50 minutes which causes the high and low tides in San Diego to occur 50 minutes later each day. When the Moon is full or new, it's lined up with the Earth and the Sun. This alignment creates extra strong gravitational forces that cause the tides in San Diego to be very high and very low. These are known as Spring Tides (nothing to do with the season). On the other hand during the Moon's quarter phases, the Moon is at right angles to the Earth-Sun lineup. This cancels out some of the gravitational forces and the tides are weaker. These are called Neap Tides. Spring Tides and Neap Tides are about 20 percent higher and lower than normal. See the chart for San Diego tides. A rare and exceptionally high tide occurs when the Moon is both unusually close to the Earth (at its closest perigee) and in the new moon phase (when the Sun, Moon and Earth are aligned). This is called a Proxigean Spring Tide and occurs at most, once every 18 months. The online chart for San Diego tides shows the expected tidal heights under average weather conditions. The actual sea level may be different during unusual weather conditions. 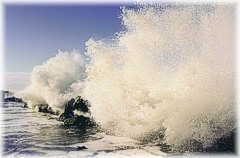 Generally, prolonged onshore winds or a low barometric pressure produces a higher sea level than predicted. Conversely, offshore winds or a high barometric pressure causes a lower sea level than expected. Be sure to take these conditions into account when making San Diego tide-critical decisions. When storm surges or extreme weather conditions are approaching, be safe and sure by checking the San Diego Weather Forecast to see how it may influence San Diego tides. There are many situations when it's important to know the exact time, height and extent of San Diego tides. See the chart for San Diego tides. Fishing, boating, surfing, diving and other water-related sports activities. When enjoying a walk on the beach, looking for rocks/shells and exploring San Diego Tide Pools. When navigating through intra-coastal waterways, estuaries, bays and harbors. For harbor engineering projects, construction of bridges, docks, breakwaters and deep-water channels. Charting data for hydrology and setting base lines for ocean-front property boundaries and territorial limits. For planning underwater demolition and other military engineering projects. Is this a great time to buy a home? Click here to search San Diego real estate for sale.